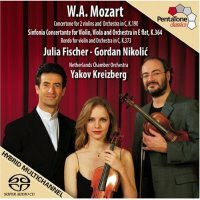 Julia Fischer has previously recorded the violin concertos for PentaTone (5186 064 and 5186 064); it will come as no surprise to anyone acquainted with those fine discs that the present issue has a legitimate claim to being the best Mozart orchestral recording of the past year. It offers unadulterated Mozartiana in supreme measure. Kreisberg directs crisp, articulate accompaniment and the Netherlands Chamber Orchestra responds with remarkable spirit throughout the programme. Above all, the collaboration of Fischer and Nilolić in the Sinfonia Concertante produces a perfect balance between the two solo instruments. All too often in this music, the violinist can run away with the piece but Fischer demonstrates wisdom and forbearance in leaving her partner sufficient space. Their playing is equally impressive in the Concertone with Nikolić on the second violin. Hans Meyer (oboe) and Herre-Jan Stegenga (cello) also make significant contributions to the piece. For the rondo, Julia Fischer performs her own cadenza. This is a splendid addition to the Fischer discography and exactly the right sort of music to take away the chill of a long Canadian winter. That Man Nikolić: Gordan Nikolić was born in Serbia in 1968. He is currently the leader of the London Symphony Orchestra and the artistic director of the Netherlands Chamber Orchestra. He also holds professorships at the Royal College of Music and the Guildhall School of Music and teaches at the Rotterdam Academy for Classical Music. Gordan Nilolić has directed the Netherlands Chamber Orchestra in recordings of the music of Britten, Bartok and Hartmann (PTC 5186 056) and Haydn (PTC 5186 300). He performs on a Lorenzo Storioni violin dating from 1794.